While the World Series has been postponed twice, this new schedule actually dates back to June when Busch North and the Modifieds were schedule to run a doubleheader. Both series got to practice, but qualifying and the feature races were rained out and rescheduled for early October. That event was rained out again and rescheduled for later in the month. However, the string of wash outs has forced the Modified Tour 100 lapper to be cancelled and the Busch North 100 lapper moved to be part of the World Series. “As far as putting the two series together, there just really wasn’t any more time left,” said Hoenig. “The Busch cars have to go to California and NASCAR was very concerned over that part of it. We tied everything together with the cooperation of NASCAR. Juggling all of those divisions took some work. Those teams know that the track can’t control the weather. Now, a revised plan for the race has been put together and an optimistic forecast for the weekend has been issued. This all sets the stage for one of the most unique events that the region has seen in recent history. There will be 15 divisions of racing over two days at Thompson, with Busch North and the Modified Tour, as well as the ISMA Supermodifieds, holding their season finales on Sunday afternoon. “This was a major schedule change for not just us at Thompson, but for NASCAR and the other sanctioning bodies that were involved in this very frustrating exercise of trying to run our World Series and the Twin 100s,” said Thompson Director of Operations Russ Dowd. The promoters, teams and fans of the NASCAR Whelen Modified Tour and NASCAR Busch North Series are hoping that the third time is the charm when it comes to running the annual World Series at Thompson Speedway (CT). For the past two weeks, the event has been washed out by a record amount of rain and flooding in New England. 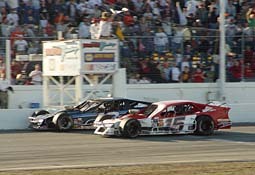 A photo finish between Ted Christopher (#13) and Zach Sylvester (#15) at The Icebreaker kicked off the season at Thompson. Part of that cooperation has been getting a race in for the NEMA Midgets. The track added that division to the racing card this week after not being sure how they would get that event in due to a scheduling conflict with nearby Waterford Speedbowl. Waterford has pushed their racing card back one week to solve that problem. The track knows that the weather situation has had an effect on teams and fans. They received criticism two weeks ago when they pushed on with plans to try and hold the race despite poor forecasts for the weekend. Throughout the day on Friday, officials thought that clearing was possible and the race could get in with a few adjustments, but overnight on Friday a record amount of rain fell through the region, leaving no choice but to pull the plug. To reward race fans, the track has reduced admission prices for the weekend. Instead of costing $50 for grandstand and $75 for pit entry, the event will now cost $35 for general admission and $45 to get into the pits. Rain checks from the June race will be accepted and anyone who purchased a World Series ticket at the full price will get a refund from the track. The track is ready to go. There is no damage to the facility from the floods and if the skies are clear, the track is ready to go. Earlier this week, the forecast for this weekend didn’t look too positive. A 30% chance of showers was forecast for Saturday and Sunday, but as of Wednesday that chance has been reduced to 10%. “We finally have a promising weekend of traditional New England sunlight coming…hopefully,” said Hoenig. And if it does rain, what happens next? 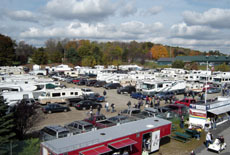 The following weekend (November 5th and 6th) Thompson has their annual Racing Flea Market and Swap Meet scheduled and most of the Modified teams will be in North Carolina at the non-NASCAR sanctioned North vs. South Shootout. On November 12th, the NASCAR Busch North team will be in California for the NASCAR All Star Showdown. Working around those events would be a tall task. And if Saturday gets rained out, there the option of trying to run all 15 races on Sunday. And hopefully, weather won’t play a part this weekend. “We have racecars that have been in the pits here for [what seems like] months,” said Hoenig. “Now, we’ll just pray for good weather and have a good weekend."